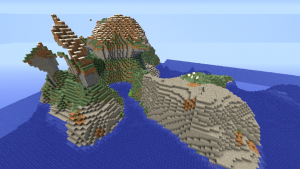 This week’s seed is all about island survival. But unlike most island survival seed that leaves you with next to nothing at the start, this one is pretty easy and pretty generous. 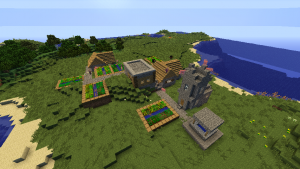 This seed will spawn you in the middle of a very small village with a blacksmith in the center. The blacksmith has some awesome loot inside, but unfortunately none of it will help you in the early level of the game – except for a single apple. If you are new with the island survival genre, then this one is just the right for you. Resource wise, the island almost has it all. 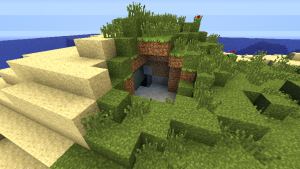 There are surplus of trees, open caves, sand, grass, and even surface level lava. The village at the start also provides shelter making it very easy to start and prosper. 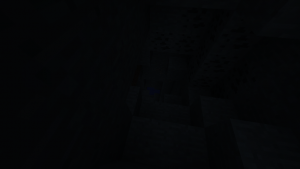 The caves in this seed are all narrow and relatively small, but looking deeper you will see that the caves themselves go very deep with possible loots and dungeons, so you better watch your steps while exploring. Animals also spawn near the village in bountiful numbers so maintaining your food supply is a breeze. Build-wise the island is large enough to support 2-3 large villages, so expanding is a good possibility. If you have prospered the island (which won’t be a hard thing to do) you can travel to the sea and begin your life anew. 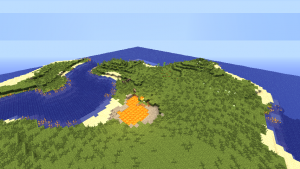 Most survival island doesn’t have a mainland that’s discoverable, but this one does! 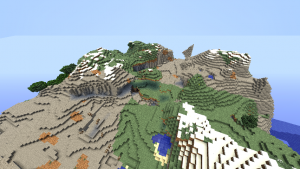 Albeit far, the mainland has a complete set of biome from huge mountains, swamps, to snowy fields and ice spikes. Overall, this seed is best for multiplayer and role players. Starting out on a simple humble island then exploring a whole new world.